This is my second course with Sheridan Samano, but the first one I have completed. She recently retired from teaching college-level biology to focus on her tourism company. Unlike the landscapers and homesteaders I have been learning from, this class felt like a college class. But it was the kind of class you hoped to get, the kind where the professor is so excited about the subject that you can’t help but get caught up in the enthusiasm. It is a six-hour class. Usually it is broken up over three weeks, but this particular round was two three-hour Saturdays. It was an intense amount of information, but very useful. We covered general ecology information before we moved on to more Colorado-specific information. Ecology is the study of interactions between an organism and its environment. When we think of this, we tend to think of plants and animals. In fact, ecosystems are named for their dominant plant species. However, it is the abiotic, non-living, factors that determine the dominant plant species. The plants then determine what animals can be supported in that area. What does this mean to a gardener? If you don’t have the right abiotic factors, sunlight, temperature, moisture, etc., then your plants are going to have a difficult if not impossible time surviving. I spent the drive home on the first Saturday noticing that there was still snow on the north-facing slopes despite the unseasonably warm weather. In the northern hemisphere, the north-facing slopes are cooler and wetter than the south-facing slopes, due to less sun exposure. 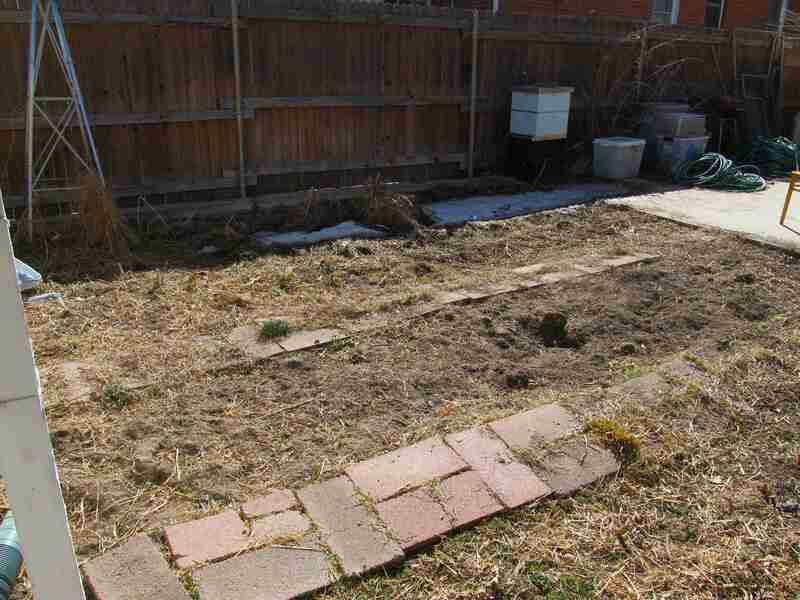 That would not be the place for an early spring garden. When we were discussing biotic (living) versus abiotic (non-living) factors, it was interesting to note that soil is considered a biotic factor. The minerals worn from rocks are abiotic, but when you add in the organic material and the organisms that make that organic and inorganic material available to plants, it becomes biotic. In other words, it’s a living organism that you can kill. This becomes important when you think about fertilizers. Too much or the wrong thing can kill the soil as much as the plants that are using it. I am very interested in the idea of making gardening easy. I like to garden, but I have a lot of interests. I only have so much time to devote to each. When you think about fertilizing, instead of automatically dumping on x product, organic or not, at y time because you always do, think about whether or not there’s a need for it. Are you seeing evidence of a lack of particular nutrients? Is it a vegetable garden where you know that you don’t leave any vegetation to decompose for use the next year?Those are the times that Sheridan suggest that you fertilize. That way you are providing what is needed, but no more. I really enjoyed this class because gardens really are little ecosystems. They can be healthy ones or they can be faltering ones. The more we understand that a garden is more than the plants we thought were pretty and plunked in the garden where we decided they should go, the more we can understand how to help a faltering garden or appreciate one that is a successful balance of so very many variables. I also now have a desire to take a trip out I-70 to the east so that I can watch the march of all the different ecosystems we have, here, in Colorado. My car was broken into this week. The thief made off with items that totalled less than $200 new. They were no longer new. I now have to pay over $200 to have my broken window replaced. This has, of course, been reported to the police. However, I got the distinct impression that because there were no credit cards involved or other information that could be used in “identity theft,” that it would go in the “not very important” pile. This is not saying anything against the police. They have finite resources, and catching killers is more important than catching this not terribly bright thief. However, it highlighted the fact that unless an item is given significant monetary value, it has no worth. Let’s go over what this clever criminal stole from me. This was clearly a “smash and grab” job, as they smashed in my window and grabbed the bookbag and briefcase-like binder in my passenger seat. The bookbag contained clothes that would be worn to the barn. The bulk of the monetary value they stole was made up of my riding boots. I can’t imagine they have any significant resale value, as they were comfortably broken in and in need of re-sealing against water. There was also a pair of, let’s be polite and call them “well broken in,” jeans and a shirt I think I paid $5 for at a discount store. 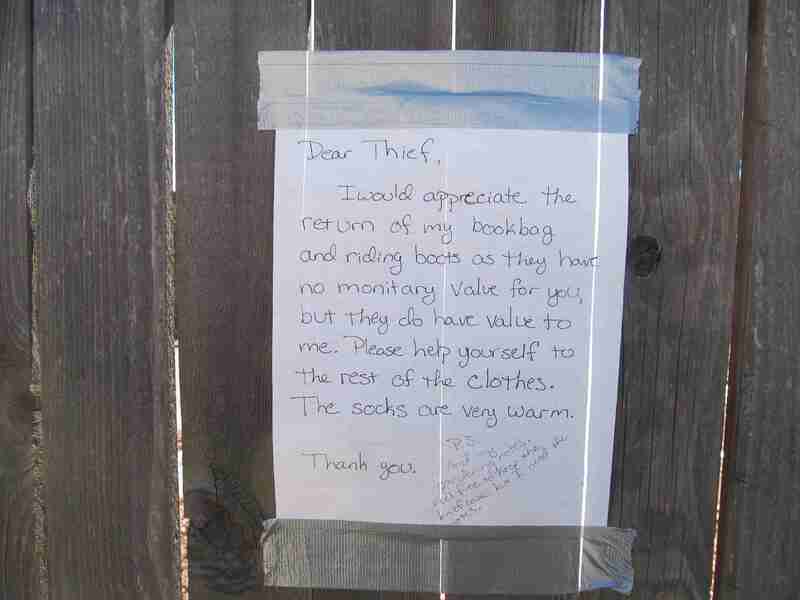 I sincerely hope, though, that they appreciate the rather pricy and very warm wool socks. The other item was a nice, pleather briefcase. I got a pleather one because leather was too expensive, and I needed something that I could brush dirt off of easily. It contained the notes for the gardens I’m working on and the notes for every single class I’ve posted here, along with a couple I haven’t posted about yet. couldn’t thoroughly process in class will be lost. However, there is no way to assign significant monetary value to either item, so it isn’t worth going after. Never mind that it was the basis of a business I am trying to start. Never mind that I’m probably going to just have to take the classes over in order to re-take the notes to re-examine them and re-learn the material. If you are putting together a mental image of this situation, add in the duct tape along the weather-strip on my windshield. That’s right, this thief is stealing from someone who’s car is duct taped together. What’s your identity? Is it your bank balance? Or is it something of less “value” and more worth? I recently finished the class Growing a Business with Marie Peacock. She is a landscaper of about 12 years and she has been teaching this class to help others get the information she would have loved to have when she started. It was a very interactive class made up of everything from current landscapers/business owners that are looking to learn more to people like me that are trying to figure out whether or not to dive into this industry on our own. She encouraged questions and discussion so that we could learn from each other as much as from her. She also didn’t sugar-coat her information, which made us really take a good look at what we were doing or what we wanted to do from a business perspective rather than a personal one. After we went around the room and introduced ourselves, since we would be working together for four classes, she had us define the word “entrepreneur.” The literal translation from French is “risk-taker.” Everyone was there to take risks, some had already made the leap, others were considering it seriously enough to pay for a class on it. The next thing she told us was that she wanted us all to succeed. There was work enough for all of us. I think it helped that as we introduced ourselves, we each discussed what we were hoping to achieve. Except for the two students that were there to start a business together, none of us had identical goals. One other person was focused on food production, as I am. Some were interested in natives, some in xeri-scaping. Some of us wanted to get our hands dirty, some were more interested in purely design. There would be some overlap in the edges of some of the proposed or actual businesses, but not as much direct competition as you might see in other industries. Of course, the variety of possibilities means that unless you are a basic lawn-mowing-type service, there isn’t a going rate. Much of the class was helping us understand the expenses that go with owning and running a business, there are a lot, and how to price our services fairly but still allowing us to make money. After all, for most of us the hope is for the business to partially or totally support us. Even as the child of business owners, I didn’t know much about owning and running your own business except that it’s hard. As difficult as it is, and as much as you need to know, I am now feeling like I could actually handle it. Prior to this class the whole idea was overwhelming. I very much enjoyed the fact that it was taught by a non-business-major business owner. She learned this information the hard way, as many of us had or expected to. She was also focused on what we really needed to know rather than what a more official business teacher might have considered necessary. As a gardener herself, she was able to point out the things that we would need to learn, like payroll and taxes, even though it probably wasn’t at the top of the list of things that interested us. I have enjoyed all of my classes at the Denver Botanic Gardens, but this one had the most camaraderie by far. Marie told us on the first night that she wanted questions and observations, and her willingness to not just answer them, but engage in discussions about them really encouraged us to share our own stories and ask each other questions. There was one major drawback to this class, though. Marie was so willing to share information and answer questions that I didn’t want to leave the room for the break in the middle of class for fear I would miss something. I have a passing interest in history, mostly to fuel my interest in stories. I have been working on a story set in Boston in 1705. It is a part of our history that isn’t very well known, since there weren’t any major land discoveries or wars at that point. That makes it a little hard to get into the minds of the characters, since I can’t go to Gettysburg as I could for a Civil War story or Lexington, Massachusetts for a Revolutionary War story. Two major sticking points for me to really understand the main character’s life are a town house that produces much of its own food and the associated chores as being social occasions. I got to experience both this weekend with the Heirloom Gardens Meetup Group. her apprentices have. I think it’s a great idea for letting people that can’t be apprentices due to time or distance restrictions, like myself, still participate and learn. I happened to be up in Denver on Saturday for a class, so I signed up to help plant garlic. It is usually planted in the fall, but this was an experiment to see if it could be planted in the spring for those of us that didn’t manage to plant it in the fall for whatever reason. made sense to keep the egg-makers in the back yard. They are also excellent non-fossil-fuel-using garbage disposals. 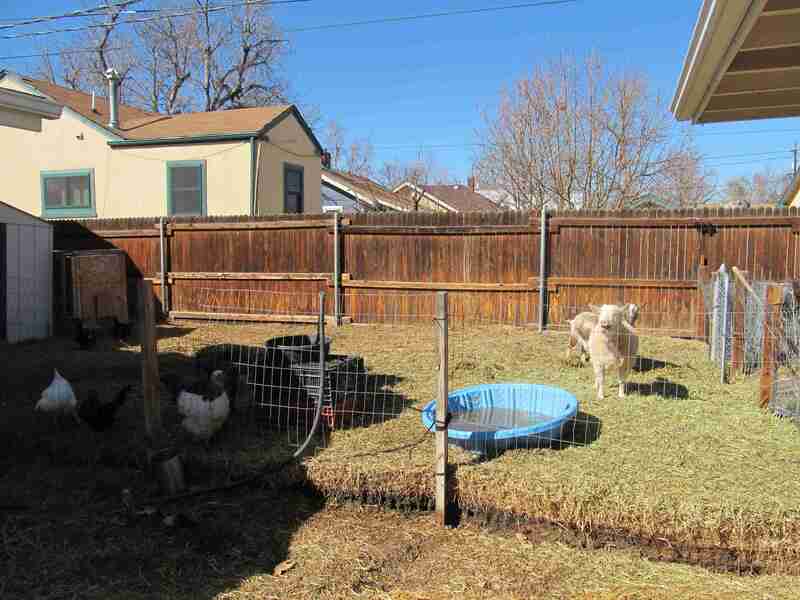 Of course, not everyone would have every kind of animal, but when you don’t have neighbors on one side with a milk cow or goat and a neighbor on the other side raising ducks to trade with, it does help to have them all yourself. 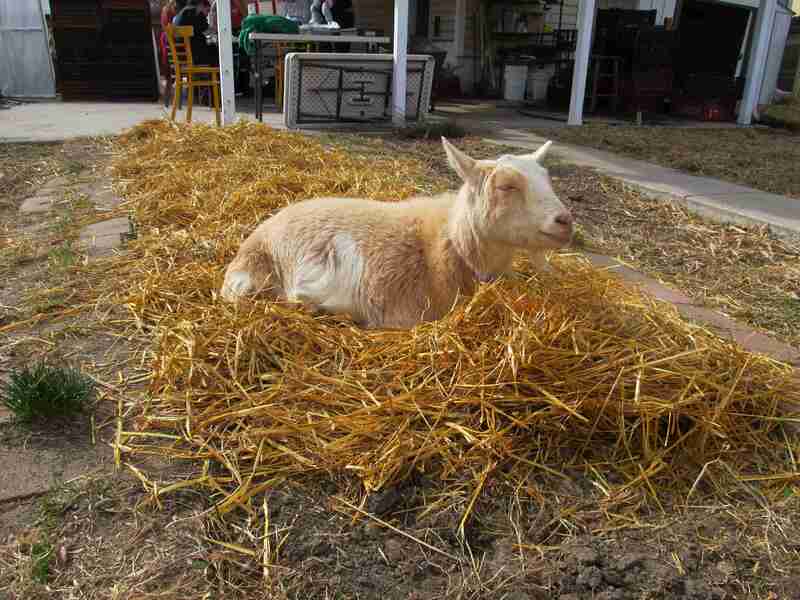 Ooh, comfy garlic bed . . .
mountain biking along with gardening and small-business challenges. We also talked about the goats that were out and about in the yard so they didn’t feel left out. Naturally, they insisted on being in the middle of what we were doing more often than not, since that had to be the most interesting part of the garden. Once all of the cloves were planted, and the end of the bed was marked so that something else could be planted in the balance of it, all we needed to do was mulch it with straw and return the goats to their pen. we sat around chatting about gardening and, there were a couple of mothers present, children, among other things. The plastic seedling trays and PVC-pipe greenhouse are modern inventions, but the conversation could have been held just as easily over quilts or shelling peas. I was the newest addition to the group, and some of them had been doing these things together for a while so they had a shared history. I am starting to see articles in various places about activities you can do for entertainment for free, since so many people are more strapped for cash than they were just a few years ago. However, chores seldom make the list. They should, though. Sundari mentioned that we probably planted about a thousand seeds. Those will become a thousand plants that will feed her CSA. All of this while trading ideas and getting to know one another in a far quieter atmosphere than a bar or a club and a far less expectant atmosphere than a networking event. is an interesting blend of modern techniques including blogs and meetups and good, old-fashioned chore-sharing and swapping. There are some things that just can’t be explained in a tweet or taught in a blog post. There are some experiences that still have to be, well, experienced. It’s an older book, but The One Straw Revolution by Masanobu Fukuoka is still a good read. When I was poking through the library at the Denver Botanic Garden, I picked it partially for the interesting title and partially because it is a slim volume. After all, I was already reading other books and I would be returning it in only a couple of weeks. I figured it would be an easy read and one more thought to ponder. Don’t let the size of the book fool you. The book is written with the same spare elegance that seems to personify his “do-nothing” farming technique. It is simple, it is straight-forward, and if you’re paying any attention at all, it packs a heck of a punch. He relates stories with humor and mistakes with humility, the whole time knowing that there is a better way. His instructions are as understated as his description of his farming technique. It does require that you do something. However, he discovered that if he worked with nature rather than against, that he needed to do a lot less than traditional or modern farm techniques require. His particular techniques are designed for his home in Japan, but the theory behind them is applicable anywhere. The two main themes that I pulled from this book are that we aren’t the be-all and end-all of knowledge (his sudden revelation that he understood nothing- as in recognizing the insufficiency of intellectual knowledge), and that we are making things too difficult for ourselves (“do-nothing” farming). Both of these are ideas that I have been coming to understand but hadn’t put words to until I read his. As he was coming up with his farming techniques he was bypassing centuries of traditional farming techniques and the budding agri-business techniques. (At the time it was written in 1978, he had already been farming for about 40 years) Rather, he looked to how plants were grown and produced without any outside influence whatsoever. He looked to nature. As a young man, he was a scientist and a researcher. The revelation of understanding nothing sent him from the microscope back to his father’s farm where he began to explore this concept further. Through trial and error, being a good scientist, he discovered that the less he did to work against nature’s preferences and habits, the less work he actually had to do. By harnessing the natural rhythms and seasons, he figured out that for a quarter-acre field, two people can take care of the planting of summer rice and winter grains with only a couple of days labor in the fall. A field that will probably yield 1,300 pounds of the winter grain alone. His yields are consistently in line with the best of the harvests in his country. There are concepts that I disagree with, and some that I am simply not ready to wrap my head around. I don’t believe that rice and vegetables makes a complete diet- even if they are the highest-quality vegetables you can find. I do believe that too many of us are out of touch with what food is and where it comes from. I am not ready to sow my vegetable seeds by just scattering them on the ground. However, I am working toward the idea that there are easier ways to grow them than “Big Ag” would have us believe. As I don’t live in Japan, the details aren’t good for much more than an illustration of his points. However, at some point I intend to acquire a copy to keep around as a reminder of the philosophy behind those details. Look around. What is working where you live, and how are you making your own life harder because you didn’t notice it? This was a full day of classes designed to get us set up for the upcoming growing season. There was a huge number of gardeners there, so it was set up like school, where you had a schedule and the instructors were each teaching their class several times that day. Apparently the instructors had been told they would have more time than they did, so the classes were all kind of rushed. However, as usual, they did their best to give us the information we needed to be successful. Being the clever girl I am, not only did I arrive a little bit late, I then proceeded to lock my keys, and membership card, in my car. I missed most of my first class, Beginning Vegetable Gardening taught by Betty Cahill. What I caught at the tail end was interesting, and I did get some good handouts to study, including lots of reference material. She also pointed out that the lettuce we harvest will hold up better in the refrigerator if we don’t wash it until we are ready to eat it. The second class, Annuals and Perennials for Color in the Garden with Marcia Tatroe wasn’t at the top of my list of things I was looking for that day, since I’m mostly interested in food, but I got some very good concepts. Things like, the only things that you can read off the label and be sure of are the dimensions of the plant and the color. Everything else should be taken with a grain of salt, especially if the plant wasn’t raised locally. Most green-house plants are raised on the West Coast due to their mild climate. Unfortunately, this doesn’t prepare them for our harsh sun and less-than-mild weather. Just because a plant is a perennial somewhere else does not mean that it can be a perennial here. Even more to the point, the instructor’s gardens are at an elevation just 800′ above Denver Botanic Gardens and she has to grow as annuals some of the things the Botanic Gardens grow as perennials. One point that applies equally well to vegetable and flower gardeners is to not be afraid to be harsh with and even kill your plants. They aren’t puppies! In other words, pulling out mis-placed volunteers and thinning young plants to the mature spacing isn’t just necessary, it’s actually good for the garden as a whole. If you are working with xeric plants, you also want to be sure to treat them in a way that they have evolved to handle. That means that amending your whole bed into rich, black, highly organic soil might actually kill the local flora. On the other hand, if your yard has a sandy patch and a clayey patch and a low, wet patch, you can grow a wide variety of plants. Lunch was burritos from Chipolte and Gorgeous and Easy Container Gardens with Susan Evans. I think my favorite part of her lecture was the idea that you should build your gardens to your preferences, not to your neighbors or for the cars on the street. Your neighbor might look out their window at your front lawn every day, but that doesn’t mean they get to dictate what is in it. There was a lot of discussing how to put things together and classic design concepts. However, in the end, it is yours. Make something you like. She discussed fragrance gardens. She has one at nose-level beside her favorite chair and she suggests having one on the way to the car. That way you can pluck off a piece to lay on your dash as a non-toxic air-freshener. When you are picking your pots, plastic is probably the best bet. Clay is pretty, but it wicks water out of your plants. Given our dry climate, that’s a problem. You should also consider larger rather than smaller pots, as they also hold water better. She is an herbalist, so she gave us some tips on them. Basil and cilantro don’t dry well, so both of those can be pureed with a little olive oil then frozen in ice cube trays. The rest of the herbs can be cut, bunched, and hung to dry. However, she reminded us several times to remember to take the bunches down for storage. No one likes peppermint and cobweb tea. The herbs should be stored in glass and as whole as possible, as you lose the essential oils when you chop or crush them too early. My next class was Soils and Composting 101 with Carl Wilson. This was the only class that didn’t feel rushed, but I got the impression that not much could rush him. I finally got definitions of silt and loam in this class. Silt is mineral particles that are mid-way between sand (large) and clay (very small). Loam is unlikely to be found around here, but it is about 20% clay, 40% sand, and 40% silt. Clay is so dominant that at only 20% of the amount, it has a significant impact on the texture. Given a choice between sand and clay, clay is actually preferred. It has a charged surface, unlike sand, so it holds the nutrients that you add far more easily, keeping them within reach of plants. However, if you go significantly in either direction, the mineral content can give you challenges to work through. I thought it was very interesting that managed Western soil is only 5% organic matter at the most. More than that and you can have trouble with the nutrients actually getting to the plants and not being stuck in the soil. A big part of that is having enough organisms in the soil to break down what you add to things that the plants can use. He also discussed the fact that residential soil, what most of us are working with, is not the same as agricultural or native soils. The top soil has often been removed during the building process, removing those microorganisms and hundreds or thousands of years worth of their work. That means that before anything else happens, that somehow needs to be replaced. For compost, he mentioned that most residential piles don’t get hot enough to kill seeds and disease. If you have diseased plants or weeds that have gone to seed before you got to them, it may pain you, but they need to go in the trash. Animal products in general aren’t added, but a lot of gardeners add eggshells. Given the naturally high lime- calcium carbonate- content of our soils out here, you may want to think twice before you add them. It does, of course, also depend on the makeup of your particular soil. Starting Seeds was taught by Patti O’Neal that I had taken a class from earlier. 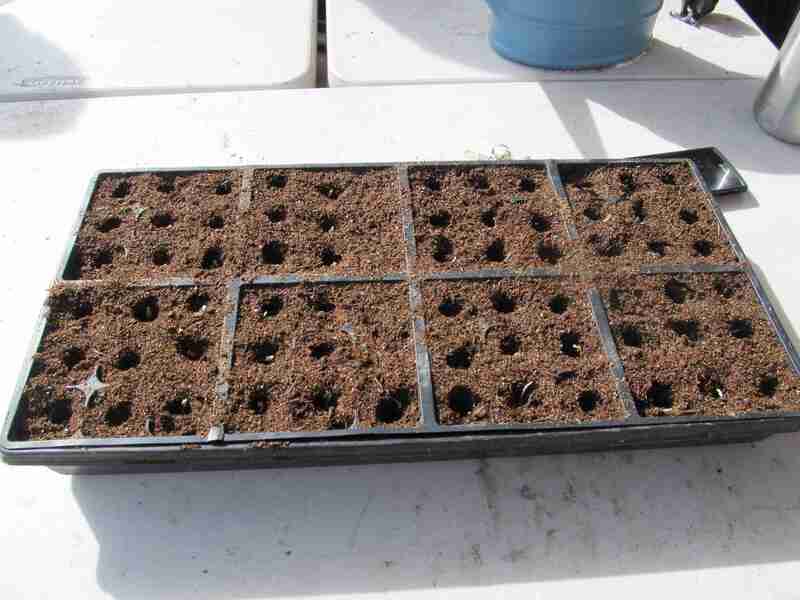 Apparently the 10 easiest plants to start from seed are beans, cucumbers, radishes, pumpkins, cosmos, peas, lettuce, squash, sunflowers, and zinneas. There were a lot of definitions in this class, but one of the comparisons that stood out was hybrid versus heirloom. Heirlooms have been around for a long time. The minimum time for a plant to have been reproducing reliably to qualify is about 50 years. Hybrids, on the other hand, are a first-generation cross that won’t reproduce true to the plant you saved the seeds from. My main interest is heirlooms, but apparently hybrids are often easier for beginning gardeners as they have had disease resistance and other perks bred into them. I may have to rethink my stance on them. She also strongly suggested that, as in most crafts, you plan twice and plant once. 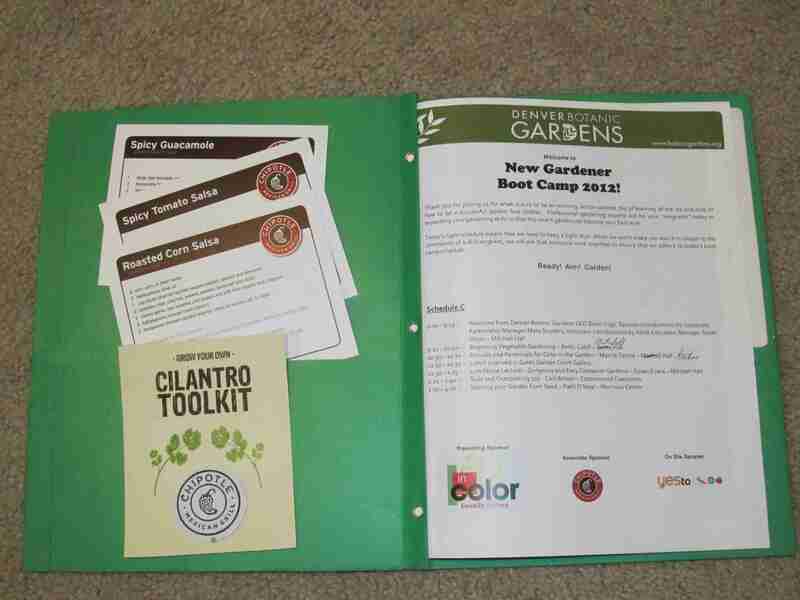 This includes reading all the information provided on the seed packets to know when, where, and how to plant the seeds. 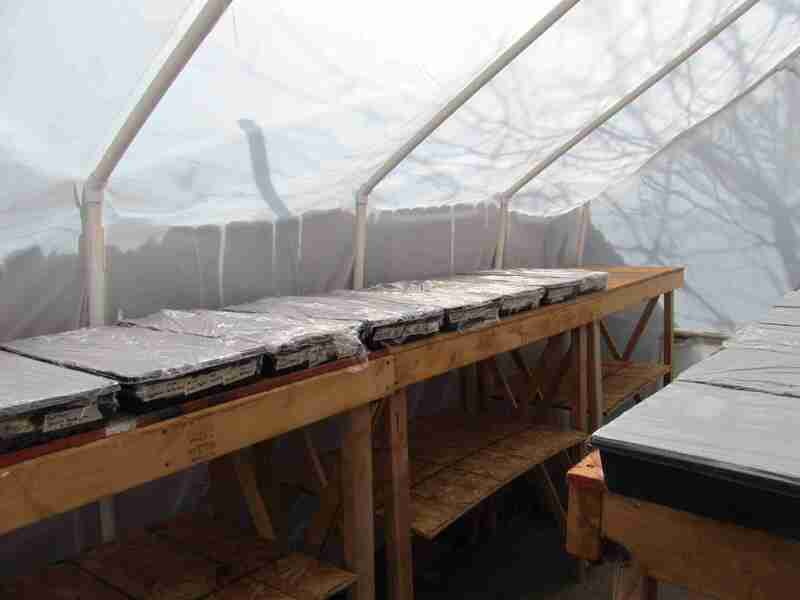 When you are saving your seeds, as they can last from year to year, you need to make sure they are cool and dry. She uses a coffee filter with kitty litter as the desiccant in her glass seed-jar. You will have better success if you store them in a cool basement rather than a garage that will heat up in the summer. After all, it is warmth and water that cause germination. 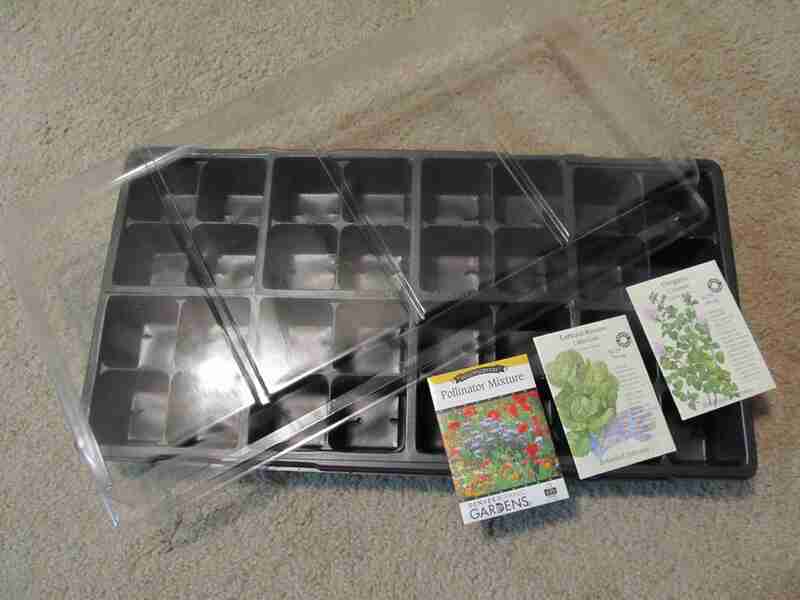 To start your seeds, what you need is a tray to catch the water, something to hold the seeds, and a cover. This could be like the spiffy, professional seed tray we were given, or it could be reclaimed materials. She likes strawberry boxes and toiletpaper rolls for kid’s projects. Bear in mind that the “biodegradable pots” that are popular right now will not biodegrade in our soil. She noted that if you are “gardening in Iowa in devil’s food cake” they work fine. However, as noted above, we have a low level of organic material which means fewer of the organisms needed to break them down. The seeds will need warmth of some sort and the seedlings will need light. If you have good windows, that can work, but they tend to grow better if you actually have a light installation. It can be affordable fluorescents as long as you get one warm and one cool to capture the full spectrum. The goal is to get short, stocky, bushy plants in varieties that you can’t find at most nurseries. This post turned into something of an epic. I apologize for that, but I only scratched the surface of what we were given. Between those classes and some others that I will be writing about when they finish, my head might just explode from the information being stuffed in. However, it is all so very pertinent that I couldn’t be happier with finding the Botanic Gardens for classes. I knew I needed a sharp learning curve to get up to speed with local conditions and helping others learn the basics, and this is giving me that flood of information. This isn’t a Bridget Jones-esque complaint about when Mum will stop asking if I’ve got a boyfriend yet and smug marrieds setting me up. Although if it netted me Colin Firth, I’d be willing to put up with it. No, this is about the challenges of being really independent. America is all about “pulling yourself up by your bootstraps.” Physical impossibilities aside, no one ever really does it alone. I know. I’ve tried. I have this independent streak that makes me want to do it myself. Just me! I don’t need help! But if I’m honest, I get help anyway. Of course my family fed, clothed, and sheltered me. But I was also encouraged to explore and try new things. Like horseback riding. It will never be anything but a financial drain- er- wonderful hobby- for me, but it has given me skills with practical applications. Like absolutely no fear of horse manure. I have friends that have done everything from shelter a horse I really couldn’t afford to teach me people skills. There is give and take in every relationship, but I didn’t do any of those things alone. Now I find myself in a place where I don’t have the ties of family or years of shared history and it’s really highlighting that I can’t do this alone. I need support of some sort. I am meeting some wonderful people and slowly developing that web that everyone needs. We are, after all, a social creature. I am, however, a long way from what I am finding I crave. I hesitate to use the word family, as it’s not the biological ties that I’m after, but it has that feel. People that I know inside out. People that really know me. People with complementary abilities. The kind of deep, intimate ties that aren’t encouraged in a world that is based on your number of Facebook friends and Twitter followers. As a single person living alone, all the chores fall on me. I go to work to pay the rent and then come home to cook and clean. If I want to buy a house, it’s my credit score that determines the interest and my income that has to cover the mortgage. We all know the stories of the one that stays in a miserable job to support their significant other that is going to school or starting a business. What I should be doing right now is getting a job with the professionals already in the field that I want to join. Unfortunately, I don’t have a husband that can sign me onto his health insurance and make sure that we have at least some income all 12 months of the year. I have to stick with the field that does offer these things. Once upon a time, it was understood that each helped in their own way, and being a single person living totally on your own was very unusual. This is not modern-day specialization where all I know how to do is one tiny part of the process. I could chip in to help with anything, but since each has their own strengths, I tend to do the things that cater to them. One was domestic, taking care of the house and cooking. Historically, this was the wife, but more and more husbands are taking on this role in one-income households. One was the income-earner as farmer or laborer or merchant. If you look at history, it’s amazing how many widows went on to take over their late husband’s business, whatever it was. Even the children had jobs- assigning the antsy little boy to swatting flies away from the food on the kitchen table. These days that has turned into asking the kid to fix the computer problem. This went beyond the family. Once upon a time, each village had a blacksmith and a baker and a cobbler (if anyone even knows what that is anymore). It may not have been advertised, but you knew which women made the best preserves and which men could mend harness like new. Even the weird woman that lived half in the woods had a talent. She was probably the one that you went to when a fever wouldn’t break or a beau wouldn’t propose. So what does this have to do with homesteading? As much as my independent streak wants me to learn it all and do it all, it’s really not practical. I happen to me mechanically disinclined. When my truck breaks down, I could learn how to fix it. Or I could know someone who is in fact mechanically inclined. If I’m lucky, that person will happen to need some help with their vegetable garden. Networking is a buzzword that annoys me. Mostly because I’m bad at it. Showing up at a “networking function” to pass out business cards and meet people that might be able to help me in the future just isn’t something I’m good at. However, I’ve been discovering that , it’s noting more than the family and village of yesteryear that could provide what I cannot. In fact, I have started developing a network purely by accident. I’ve offered skills that I have and discovered that others have simply offered theirs in return. Logically speaking, it makes more sense for us to be lifting each other up by our bootstraps rather than ourselves.